Peter doesn’t listen to his grandfather’s warnings about the wolvesin the forest.Find out what he does when he meets one face to face…. 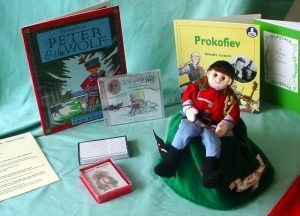 Peter and the Wolf was composed by the great Russian composer Sergei Prokofiev to introduce children to the instruments of the orchestra. * Purchased from Storysacks Ltd 2003.